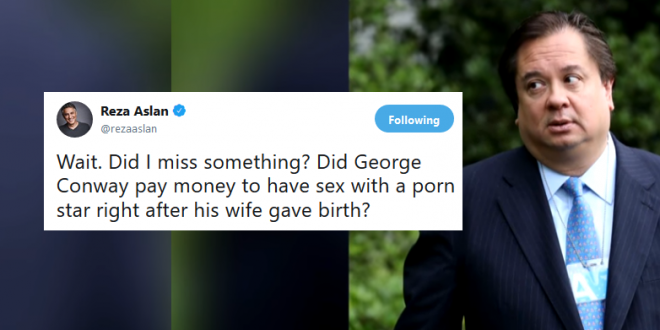 George Conway Retweets Reminder To Eric Trump - Joe.My.God. George Conway’s criticism of President Donald Trump (also known in the Conway household as wife Kellyanne Conway’s boss) continues unabated. The most recent example is his apparent re-tweeting of a remarkably harsh defense of his behavior after criticism by Trump’s son Eric. Mr. Conway has become a more vocal critic of the White House, going so far to even launch a consortium of conservative lawyers eager to bring back some conservative legal guidelines to check what he sees as Trump’s untoward behavior. The fact that his wife Kellyanne Conway is a senior adviser to the Commander in Chief, and frequently appears on television to defend President Trump’s has led to curious public discussions about the Conway marriage.